The telephone does not have to be an impossible form of communication for deaf people to use. In fact there are several telephone systems which make it easy for deaf or hard of hearing people to hold conversations across the miles, just as for the rest of us. Which systems they choose to use will often depend on the level of hearing they have left and whether they have been deaf from birth or developed it in later life. 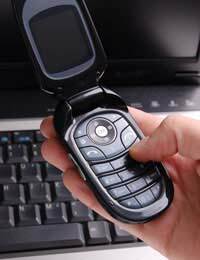 Text messages are one of the most straightforward and easy to understand forms of telephone system for deaf people, but also one of the most time consuming. The basic premise behind the system is simple. The callers type everything out rather than speak it and what they are saying appears on a screen in front of the recipient. This is fine for short and sharp messages, as most people now use text messages or SMS messages. But for longer conversations it can be both costly and time consuming, and email and instant messaging services online are usually a better bet. It would take most people an age to have a full conversation – and the cost is prohibitive, despite some companies offering a discount for deaf and hard of hearing people. It still works out a costly way of holding a conversation – but, as for hearing people – is the perfect way to exchange short and sharp messages. Typetalk is the service provided by the RNID and BT to allow deaf people to use the phone. Anyone is able to make a Typetalk call to a deaf person, simply by dialling a special prefix. The deaf person will need a special textphone to receive it. The deaf person is able to either speak their part of the conversation direct or type it if that is easier for them. The other person will then speak back and the Typetalk operator will type the reply directly back to you. All calls are completely confidential. The service is especially useful for older people who may not be conversant with typing on a phone. In addition, if people can speak, they are able to do so rather than having to type everything out. The Typetalk operative should be able to listen and type replies simultaneously, a much needed talent. By calling textphone to textphone and typing out messages yourself, it is possible to bypass the need for an operator although this is obviously a more time consuming type of telephone system. The rise in text related technology has made it far easier for deaf and hard of hearing people to use telephone systems. The Typetalk service is especially useful as it means no one apart from the deaf person needs any special equipment. Thus the calls can be made to and from everyone. When buying a textphone look out for its advantages and disadvantages, all textphones are not the same. Although they should all fulfil a basic function, the levels at which they do this and the added extras can vary tremendously.